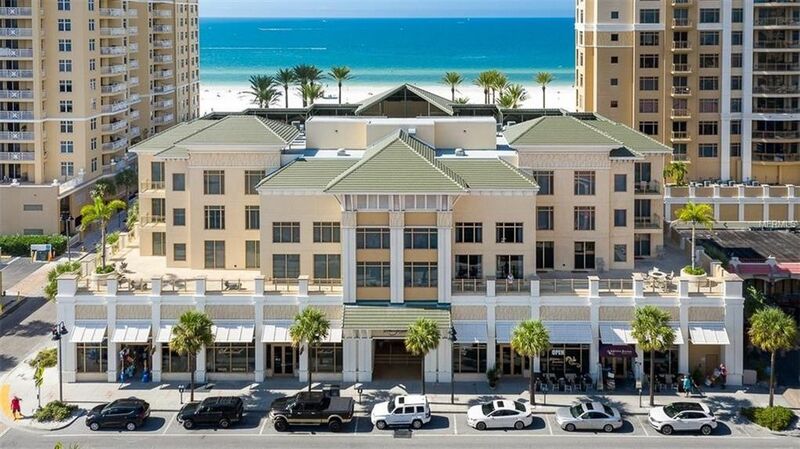 PREMIER CONDO LIVING AT CLEARWATER BEACH... THE RESIDENCES AT SANDPEARL RESORT !!! WELCOME TO UNRIVALED LUXURY AND OUTSTANDING RESORT AMENITIES!! MAGNIFICENT 'WESTERN' VIEWS IN THIS DIRECT GULF FRONT CONDO WITH 2 BEDROOMS PLUS DEN... ALMOST 1, 900 SQ.FT. OF CUSTOM CREATED LUXURY!!! INLAID 2 TONE REAL PLANK HARDWOOD, CROWN MOLDINGS, MAGNIFICENT VENETIAN PLASTER ALCOVE IN GREAT ROOM, MOTORIZED SHADES, DESIGNER CUSTOM BUILT WALL UNIT, GORGEOUS KITCHEN, UPGRADED APPLIANCES! DEN OR 3RD BEDROOM WITH BUILT IN TRUNDLE BED AND BUILT IN DESK AREA! DESIGNER GRANITES, CUSTOM CLOSET SYSTEMS, FLUSHMOUNT SPEAKERS, EXQUISITE MASTER BEDROOM SUITE WITH CUSTOM MADE BED WITH STORAGE AND REMOTE CONTROLLED T.V., RESIDENT'S STORAGE LOCKER IN BUILDING, WINE/BEVERAGE CENTER, CUSTOM BUILT DINING AREA... BEAUTIFUL!!! CUSTOM BUILT BAR FOR TRUE ENTERTAINING! EVERY DETAIL HAS BEEN CUSTOM DESIGNED!! UNSURPASSED LUXURY AND SERVICES AWAIT YOU BEHIND THE GATES OF SANDPEARL RESIDENCES! PRISTINE WHITE SAND BEACH, 24 HOUR GUARD GATED BUILDING, CONCIERGE SERVICES, BEACH FRONT RESORT POOL, POOL SIDE CABANAS, SPA, ROOM SERVICE, SECURED PARKING AND MORE... PET FRIENDLY COMMUNITY!!! Directions: STATE ROAD 60 TO CLEARWATER BEACH.NORTH ON MANDALAY AVE. TO ENTRANCE AT 470 MANDALAY TO SANDPEARL RESIDENCES CONDOS.